In recent days, the Four Courts Press in Dublin has published its catalogue for 2018. As is usual, the list ranges over almost 2,000 years, and takes readers from mediaeval Santiago de Compostela and the Elizabethan court via the revolutionary Atlantic, by way of the grave of Wolfe Tone and mass graves in mediaeval Donegal to Louth, Derry and Limerick in the Irish revolutionary period. On the way, the catalogue offers a wide variety of reading matter, including the lives of saints, some mediaeval epigraphy, explorations of the Bible, the contents of various 18th and 19th century libraries, assorted Irish music documents, extracts from the Irish Citizen, as well as a selection of regional and Sunday newspapers. Fellow travellers include Roger Mortimer, Earl of March, the land-grabbing Richard Boyle, first Earl of Cork, reformers Lord Cloncurry and Archbishop Whately, Lady Butler, Victorian war artist, members of the Redmond political dynasty and a whole host of Revenue Police, suffragettes, Dublin goldsmiths, Brigidine Sisters and Irish fishermen. I am delighted to be included among the contributors to one of the new books in this catalogue. The cultural reception of the Bible: explorations in theology, literature and the arts is edited by Salvador Ryan, Professor of Ecclesiastical History at Saint Patrick’s College, Maynooth, and Liam Tracey, Professor of Liturgy at Maynooth. This book is a festschrift in honour of Brendan McConvery, who I first got to know when he was Lecturer in Sacred Scripture at the Holy Ghost Missionary College, Dublin, when I studying for a Maynooth BD. Later, he was Dean of Faculty of Theology at Saint Patrick’s College, Maynooth, editor of Reality, and archivist for the Irish Redemptorists. As might be expected, many of the contributors to this new book include his fellow Redemptorists and his former colleagues in Maynooth. Contributions range from Saadia Gaon’s 10th century Arabic translation of the Pentateuch to Martin Scorsese’s 1988 film adaptation of The Last Temptation of Christ; from the biblically inspired writings of a late 17th century French galley slave to Paul Ricouer’s reading of The Song of Songs; and from the deep Biblical culture of fifth century Rome to the divisions that biblical verses perpetuated in late 20th century Ulster. The contributors to this volume include: Cardinal Joseph W Tobin (Newark); Thomas O’Loughlin (University of Nottingham); Cornelius Casey (Trinity College Dublin); Jeremy Corley (Saint Patrick’s College Maynooth); Noel O’Sullivan (SPCM); Michael A Conway (SPCM); Jessie Rogers (SPCM); Martin O’Kane (University of Wales, Trinity Saint David); Kerry Houston (Dublin Institute of Technology); Michael O’Dwyer (Maynooth University); Brian Cosgrove (MU); Diane Corkery (University of Strathclyde); Raphael Gallagher (Alphonsianum, Rome); Terence Kennedy (Alphonsianum, Rome); Padraig Corkery (SPCM); Carol Dempsey (University of Portland, Oregon); Thomas R Whelan (National Centre for Liturgy, Maynooth); Liam Tracey (SPCM); Penelope Woods (SPCM); Ruth Whelan (MU); Elochukwu Uzukwu (Duquesne University); Hugh Connolly (Centre Culturel Irlandais, Paris); John-Paul Sheridan (SPCM); Helen Cashell-Moran (TCD); Katherine Meyer (TCD); Seamus O’Connell (SPCM); Jonathan Kearney (DCU); Patrick Comerford (CITI/TCD); Martin Henry (SPCM); Paul Clogher (Waterford Institute of Technology); and the poet John F Deane. My contribution to this book, written while I was a lecturer at the Church of Ireland Theological Institute and an adjunct assistant professor in Trinity College Dublin, looks at the life and work of FJA Hort (1828-1892), the Dublin-born member of the ‘Cambridge Triumvirate’ who was an influential figure in translating the Revised Version of the Bible. 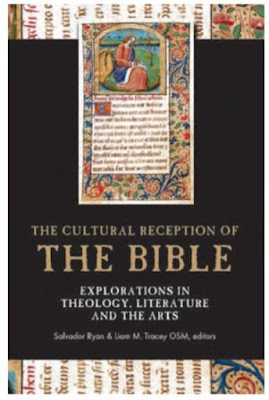 Four Courts Press expects to publish The cultural reception of the Bible: explorations in theology, literature and the arts, edited by Salvador Ryan and Liam Tracey, later this Summer. It is planned as 320-page book with colour illustrations (ISBN 978-1-84682-725-9) and a cover price of €50/£45/$70.